Officers In Stephon Clark Shooting Won't Be Charged, Says Sacramento DA Nearly a year after Sacramento police fatally shot Clark, a 22-year-old unarmed black man who died in his grandmother's backyard, DA Anne-Marie Schubert presented her office's findings on Saturday. 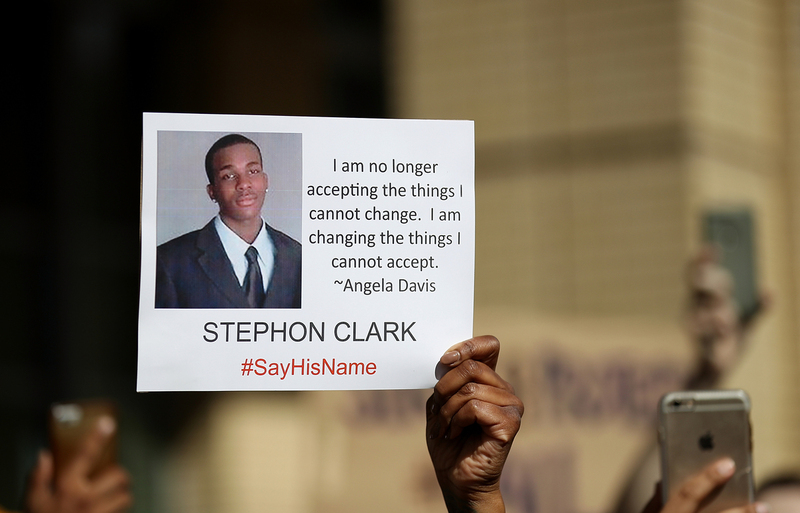 A protester holds a photo of Stephon Clark during a Black Lives Matter protest in Sacramento on March 22, 2018. Nearly a year after Sacramento police fatally shot Stephon Clark, a 22-year-old unarmed black man who died in his grandmother's backyard, District Attorney Anne-Marie Schubert announced on Saturday that the two officers who killed him will not face criminal charges. In a news conference that lasted more than an hour, the district attorney walked the public through evidence gathered by investigators and discussed the law that governs when police officers are justified in using deadly force. "The law requires that we judge the reasonableness of an officer's actions based upon the circumstances confronting them at that moment of time," Schubert began, speaking to a packed room of reporters inside a building across the street from her office's headquarters. In the end, she said, it was clear that Sacramento police officers Jared Robinet and Terrence Mercadal did not commit a crime. "We know [Clark] fled from the officers after being told to stop, we know that he continued into the backyard, and we know that when he continued into the backyard, he rounded that corner, and he went to the end of that yard and he turned around," said Schubert, describing the moments leading up to the fatal shooting. "He didn't continue to flee. He turned around and he was in a shooting stance with his arms extended." The DA said the two officers "honestly, without hesitation, believed he had a gun" before they fired 20 shots at Clark, hitting him at least seven times. Clark was killed March 18 after Sacramento police responded to a 911 call of a man breaking car windows in the South Sacramento neighborhood of Meadowview. During Saturday's press conference, Schubert said DNA evidence confirmed that Clark was the individual who broke the windows, and also smashed a home's sliding glass door with a cinder block. Two officers arrived on the scene that night, searched outside a nearby residence and, after spotting Clark, eventually pursued him into a backyard — which they later learned was his grandmother's home — where they shot at him. After the shooting, Robinet and Mercadal said they thought Clark had a gun, but they only found a cellphone at the scene. On Saturday, Schubert said that one of the officers saw a "flash of light that he believed was the muzzle" of a gun in the seconds before the shooting, and that "Clark had in fact advanced at the officers" before they fired. Clark's death sparked weeks of demonstrations and immediate calls for the district attorney to bring criminal charges against the officers. After the police department released body-camera videos from the shooting, demonstrators spilled into the streets of downtown Sacramento, at one point bringing traffic on a major freeway to a stop and, later, blocking thousands of fans from entering a Sacramento Kings game. After the district attorney's announcement, the Clark family reacted with anger, accusing Schubert of a "smear campaign." "I don't care if he was a criminal. None of that matters," Clark's mother, Sequette Clark, said outside the home where her son was killed. "What matters is how those officers came with lethal force around a corner, on a vandalism call, after my son and gunned him down — when he had nothing but a cellphone in his hand." The district attorney's decision not to charge the officers is based on a review of the Sacramento Police Department's own investigation into the shooting, which was completed in October of last year. California Attorney General Xavier Becerra's office is also conducting an independent review of the Clark case, at the request of Sacramento Chief of Police Daniel Hahn. Sacramento police's internal review of whether Robinet or Mercadal should be fired for violating department policy is ongoing, according to Hahn, and the chief has said that it will not be finished until the attorney general's review is complete. Schubert's presentation of her office's findings included a surprising amount of personal information about Stephon Clark, including an indication that he may have been contemplating suicide in the days leading up to the shooting. Schubert also revealed that, two days before his death, on March 16, the mother of Clark's children, Salena Manni, called the police on Clark to report physical abuse. "The police took a report, they documented her injuries and they took photographs at the scene," Schubert said, adding that at the time of Clark's death, he "was arrestable for this incident of domestic violence as well as probation violations." She then described text messages, Internet searches and drafts of emails seized from Clark's cellphone, which she said showed he feared he would be arrested. The DA said other messages indicate that the mother of his children was threatening that Clark would never see his children again. Investigators also discovered communications on Clark's cellphone indicating that he sent Manni text messages implying that he wanted to kill himself, including photos of him with several Xanax pills. Call logs show that Clark tried to call Manni 76 times in a period of 12 hours after the domestic violence incident. "He was distraught and had searched suicide websites," Schubert said. "You can see that there were many things weighing heavily on his mind." The Clark family and community members pointed out that, by Schubert's own admission, the police officers pursuing Clark on March 18 did not know who he was — nor did they have any idea that he feared arrest or was considering suicide. "I feel like she was charging him with his own murder," said Quenta Givens, who lives down the street from where Clark was killed. "Why are we judging him? He's already been killed. We should be judging the cops — that's who did it!" Former Sacramento police chief Rick Braziel says Schubert might have been trying to make the argument that Clark committed "suicide by cop," a scenario that occurs when someone who wants to die provokes a law enforcement officer into killing them. "I honestly thought that ... when I was watching it, [that] she was going to talk about how he had planned that to occur," Braziel said of the DA's presentation. While taking questions from reporters after her announcement, Schubert said that she was not suggesting Clark wanted to commit suicide-by-cop. Her office did not respond to a request by CapRadio asking to further discuss the issue. The Clark family declined to comment on whether the young man might have been contemplating suicide. During her own press conference on Saturday evening, Manni said she had no warning that the DA would reveal personal information from Clark's cellphone, and was angered that the DA shared details about her and Clark's private communications. In response to Saturday's announcement, Sacramento Mayor Darrell Steinberg repeated the apology he delivered to the Clark family at his State of the City address last month. "Today, the district attorney said she focused on a single question: Did the officers who shot Stephon Clark commit a crime? Her answer was, 'No,' " Steinberg said. "Our community and its leadership have different questions. Was the outcome wrong? Was the outcome unacceptable? The answer to both questions is yes." The mayor said he would focus not only on changing policies within the city, but the state rules around use of force, signaling his support for Assembly Bill 392, which would restrict when officers can use deadly force. "I will use my influence, my time, and my experience as a former legislative leader to help the parties change the standard to better protect both the community and our officers," Steinberg said. "I do not know whether a prevention standard would have changed this particular outcome. But I want to change future outcomes. We all want to change future outcomes. " Sacramento Police Chief Daniel Hahn said in a statement after the announcement that it was his department's "responsibility to continually examine all our policies and practices for any opportunity to improve how we police our community. We are committed to that on-going work as a permanent part of who we are as a department." Soon after the DA's press conference, religious leaders gathered outside Sacramento City Hall to voice displeasure with Schubert's decision — and especially with the DA's decision to reveal information discovered on Clark's cellphone that he may have been suicidal. "This was a modern-day lynching in the city of Sacramento and the district attorney should be recalled for these shameful actions," Pastor Kevin Kitrell Ross of Unity of Sacramento Church said. Inside City Hall, Tamara Bennett with This Is Pentecost Fellowship Ministries expressed gratitude toward city government and the police department. "I appreciate the chief of police for being very candid and honest during this process," Bennett said. " I also appreciate all of the brothers and sisters of the community who came to these meetings every single week to be able to come up with something so that our city will be healed and our city will be safe." Pastor Les Simmons expressed dismay at the way that the district attorney handled the announcement. "I'm first just heartbroken, as a black man, as a Sacramentan that has heard her demonize Stephon Clark and then not hold these officers accountable," he said. "I think our community is really hurting right now." But Sacramento Police Officers Association President Tim Davis said that Robinet and Mercadal acted according to their training and within the bounds of the law. "While this is a tragedy, you know, no officer ever wants to take a life," Davis said. "They're doing the best job they can in these split-second decisions and what we want to do is give them more resources and training. and that is how we'll be able to reduce these in the future, not sending cops to prison." "We're all sad right now"
During Schubert's hour-long presentation, members of Black Lives Matter's local chapter congregated outside, listening to the DA present her office's findings on their phones. Every few minutes, the group's founder, Tanya Faison, wiped away rain that had accumulated on her smartphone's screen while standing on the sidewalk. "I expected it to be bad, but not as bad as it was, and then it kept getting worse," Faison said of the DA's press conference. She added that divulging Clark's personal text messages and Internet search history was inappropriate and unnecessary. "I'm disgusted, and it's disrespectful," Faison said. "The mother of his child was completely disrespected." Onethia Riley, who volunteers with the local chapter, wasn't surprised by the announcement, but was disappointed by what she calls the "character assassination of Stephon Clark, the disrespect and the lack of compassion toward his family." "I'm traumatized by it," Riley said. Sonia Lewis, who co-leads Black Lives Matter with Faison, called out the district attorney for discussing the private information. But she also argued that it proved that Clark needed mental health care, "not to be shot." "There were so many other solutions that could have come out of this," Lewis said. "But the one thing that we know for sure is that he should not be dead and those officers should be fired." After the press conference, Black Lives Matter announced a demonstration at the Sacramento Police Department station on Freeport Boulevard, where nearly 100 people showed up. Faison said the mood was melancholy. "It feels like a vigil. It feels somber. So, that's why we haven't chanted much. We are all sad right now," she said. "We need to acknowledge the hard truth"
Also on Saturday, two of California's three most powerful elected officials vowed to rewrite the state law that governs when police officers can use deadly force. "This must be a time for change," said Gov. Gavin Newsom in a statement that called for "systemic reform." "We we need to acknowledge the hard truth — our criminal justice system treats young black and Latino men and women differently than their white counterparts," the governor added. Senate President Pro Tem Toni Atkins, a Democrat from San Diego who's been convening negotiations between law enforcement and civil rights groups on new use-of-force legislation, said in her own statement that lawmakers owe it to Clark's family "to deliver on a use-of-force model for California and the nation going forward." She said the latest development makes her "committed more than ever before" to changing the law. And California Sen. Kamala Harris, who is also pursuing the Democratic Party nomination for president, wrote on Twitter that "Stephon Clark should still be alive." "Today's news is a tragic and all too painful reminder that our criminal justice system is deeply flawed and lacks accountability. Our fight for justice continues," Harris wrote.